Hayesville thrift store, Granny’s Attic, donated more than $55,000 of its annual earnings to Erlanger Western Carolina Hospital. Granny’s Attic is a non-profit organization run solely by volunteers. The Hayesville thrift store, which sells donated clothing and small household items, has historically donated 100 percent of its proceeds to Good Shepherd Home Health and Hospice. Since the sale of this hospice facility, the officers of Granny’s Attic decided to give the money to other local organizations, including Erlanger. 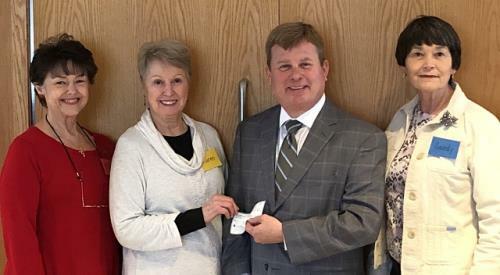 “We are grateful for the wonderful volunteers who are part of the Erlanger Auxiliary program at Granny’s Attic and their continued mission to help support our needs,” said Mark Kimball, CEO of Erlanger Western Carolina Hospital. The donated money from Granny’s Attic will fund a new Urodynamic System, Ambu Bag Trainers and scope washer. Clay County Schools also will receive funds from the store’s earnings. Granny’s Attic is located at 200 Highway 64 West in Hayesville and is open Wednesday through Saturday from 9 a.m.-4 p.m. Donations of items are accepted during hours operation.